Donna Griffin reports that that the Auburn University Montgomery (AUM) library has recently made available some of the digital records collection of Robert Earl Woodham. Click HERE to read her updates. The library is currently migrating to a new system and there are issues with the search function, labeling and descriptions. The online records as they currently stand are available by clicking HERE. Donna has offered to work with them to review and make corrections. Jim Riley has made available the results of his years of careful work and thoughtful analysis to all researchers interested in the history of our Riley ancestors. The reports submitted to date may be accessed by clicking HERE. This information is intended to stimulate conversation and feedback, and is, as all genealogy work, subject to revision as more information becomes available. Please offer comments and feedback to Jim directly or through this website. Jim Riley has updated his work on the genealogy of Joanna, Whitaker and Edward R Riley, Sr. He has also started work on Elizabeth Riley Myers. Please see the RESEARCH section. Please visit the MILITARY section to see a compilation of research performed by Ervin Riley on our Riley kin who served in the War Between the States. Please contact the Website administrator peter@johnriley-sr.net with comments or suggestions. George Beck has done some interesting research concerning Elizabeth Riley Myers in relation to Mary, daughter of John, Sr., and Mary Whitaker Riley. The results may be viewed by visiting the MYSTERIES section or clicking HERE. George is very much interested in any comments and discussion from our Riley community on this dissertation! David Gates recently submitted a newspaper clipping from 1944 describing the last battle of Curtis Riley during the battle of Germany. Please click HERE to read this moving account. Madelyn Stark has found records from NARA (National Archives) showing original vouchers and other documents describing the sale of corn and fodder to the CSA by Moses Riley (son of John, Sr.). Please click HERE to read these interesting records! Madelyn Stark has also discovered records from NARA (National Archives) describing various interactions of Edward Riley (son of John, Sr.) with the CSA War Department. Please click HERE to read. She has also found a Muster Roll Beat 9 (Dale County Reserves), which a number of Rileys and kin including Daniel Riley (age 55). Please click HERE to read. Jim Riley has recently updated his file on the Rosier Brannon Family which includes a host of John Riley, Sr families. He will be glad to share this data with anyone upon request. Please check with the site admin for contact information! 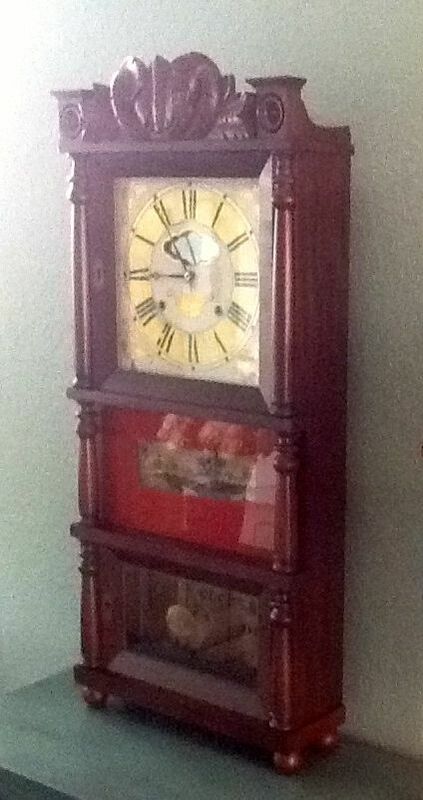 Please click HERE to read an account of this patent brass eight day clock with a Riley connection! Submitted by Sue J. Livingston. Capt. Joshua A. Carson (US Army Infantry and a Riley cousin) has authored a report on the Battle of New Hope Church, in which some of our Riley ancestors fought during the Civil War. See MILITARY section. Please visit the RECENT CONTRIBUTIONS page to see four pages of Mary Whitaker Riley's (wife of John, Sr.) estate settlement submitted by Madelyn Stark. Please click HERE to read an article submitted by Roy Strickland describing the reburial of John, Sr., and Mary Whitaker Riley at the Center Cemetery. The original article appeared in the Southern Star, Ozark, AL, on April 15, 1885. This article was submitted by Ms. Carla Miles. RILEY HEADSTONE PROJECT AT OLD CENTER METHODIST CHURCH CEMETERY. Please click HERE to visit the section documenting the efforts to replace and preserve some of the deteriorating headstones at the Old Center Church Cemetery.